Moving long distance, between states, even across the country can potentially seem like a daunting experience. You aren’t just moving your belongings, but in essence, your entire life. 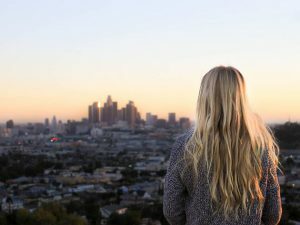 Maybe Los Angeles has always been your home and the prospect of leaving is difficult. The one thing you should not have to worry about during any type of residential or long distance move is the reliability of the moving company you choose to hire. You need to be able to trust that they can handle the task and deliver your stuff on time and within budget. We help pack and prepare your stuff in the most secure manner possible. Loading it into our trucks/vans, we ensure that nothing is damaged, everything is carefully placed and tied down when necessary. Transporting and moving clients long distances is our specialty. We guarantee convenience and extreme attention to detail. Upon unloading and unpacking your belongings at your new California location (or another state if applicable), we take the time to put everything in its proper place. We value your satisfaction and won’t stop until we’re sure you’re happy. You can visit Moving.co and Consumer Advocate to read some of our reviews. While we work with many customers in the Los Angeles, California area, we are certainly not limited to this geographical region. We handle cross state moves, interstate, residential, commercial moves as well as some international moves depending on location. The process is quite simple. When you are planning your long distance move, give us a call. One of our representatives will review the pertinent details, ask any necessary questions and then prepare a personalized moving quote. We can literally cover every aspect of your cross state or long distance California based move—to include providing packing supplies should you require any. Moving companies in Los Angeles vary, but IVL is a great choice. Basically, we put ourselves in your shoes. If we were moving from Los Angeles to some distant location, what would we want from a moving company? How about a guarantee, how about movers who are skilled and efficient at what they do, a company that is experienced when it comes to long distance moving options, and above all else a team who’ll treat your stuff as if it were their own. This is what we promise. This is precisely what we deliver. Our goal is to be as up front and as transparent as possible. The more details about your LA move you can provide, the better! Prices will vary depending on distance traveled, the amount of items moved, and the presence of any specialty items. So be sure and be comprehensive in listing your belongings. We wish you the best of luck with your move and please feel free to contact us with any questions.